I think the last time I subscribed to a game was early 2012, and before that circa 2009. Now, I’ve suddenly been subscribed to two different MMOs in the span of three months. Fittingly, the last game I was subscribed to was SWTOR, and now BioWare is once again taking my money. This time, however, the Game Tax comes with the perk of a huge XP boost to the class story rewards that allows players to level to 50 exclusively through their story from now until the expansion hits on October 19th. 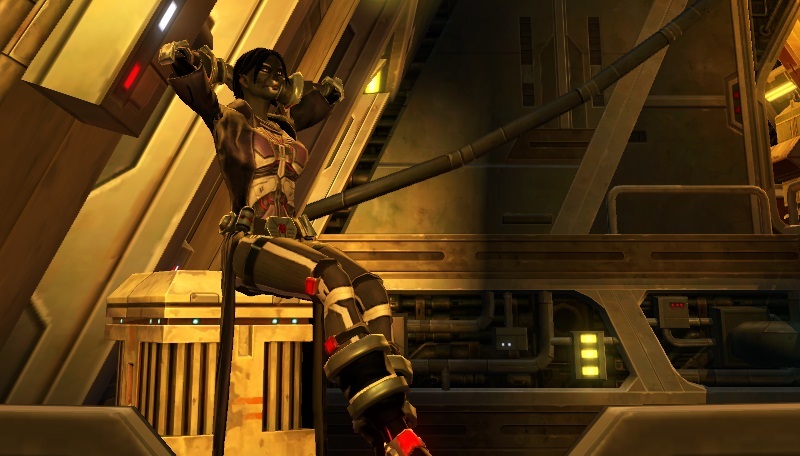 As much as I love the charm of a lot of the sidequests in SWTOR, I have to begrudgingly admit that I agree with everyone who’s saying that the story-only leveling is actually a really nice experience. It feels more like playing a single-player RPG; one main story with only as many sidequests as you choose to do. It’s also great because I can play as many different classes as I want and don’t have to replay the same quests I’ve just done. So far I’ve almost finished my powertech’s class story, and my sorcerer is in her mid 30s. I’m planning on finishing off my operative next, who is around level 40. A lot of the reason why SWTOR has never stuck for me is that I want to play every class, and I want to simultaneously be at endgame right now and experience as much of the story as I can. So basically this is exactly what I’ve always wanted. I’m not sure if I’d recommend it to someone who’s never played the game, as it kind of rushes you through the learning stages of the game, but as someone who’s played off and on since the beta and dabbled in all of the classes at one point or another, it’s great. I’ve seen some discussion among players of just scrapping the sidequests and keeping the class story XP boost on all the time, probably only for subscribers. I have a hard time being excited about this, because there are a lot of memorable quests and quest lines outside of the class story that I would miss–who can forget the Black Bisector series, or the first time you became a Revanite?–not to mention all of the light/dark decisions, companion affection, and gear drops we’d miss out on (I’ve been living on almost nothing but commendation gear since I subscribed). I know they’re reworking the leveling process for the expansion, but I don’t think they’ll be so lazy as to just leave the boost on all the time. The best solution I’ve heard is somewhere in the middle: boost the XP payout of all of the quests (both class story quests and traditional ones) by 3-5 times and leave them all in. This way you’re still progressing at a more normal rate, but you can pick and choose which quests you want to play. Either way, I’m sure the leveling experience will be better. And if it’s not, they’ll be giving you an insta-60 with the expansion (free with a subscription) so you can skip it entirely. I’m planning to use mine on a Sith Juggernaut, since my old main character was the mirror class on the Republic side, but my new guild is mostly Empire. I’ve never done the Warrior’s story, though, and I’m told it’s pretty good, so it would be a shame to skip it. We’ll see.